Kebap (or kebab) simply means "roasted," and usually refers to lamb roasted in some form, but may refer to chicken—or even (roasted) chestnuts—as well. 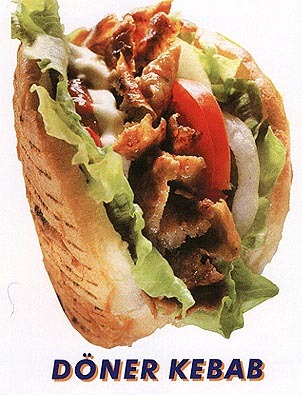 Döner Kebap is lamb roasted on a vertical spit and sliced off when done. When laid on a bed of chopped flat bread and topped with savory tomato sauce and brown butter, it becomes Iskender (or Bursa) Kebap. 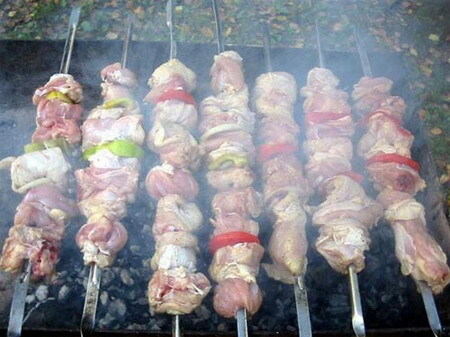 Shashlik is chunks of lamb interspersed with tomatoes, onions and peppers/pimientos (although any good Turkish chef will cook the lamb and vegetables on separate skewers because their cooking times are quite different).